While there are plenty of ways to get outdoors over the summer months, nothing makes the season more complete than a lazy float trip, where you can while away the hours soaking up the sun and cooling off with the occasional dip in the water. And with 130,000 miles of rivers in Alabama, there’s no shortage of options for an easy float, whether your craft of choice is a canoe, kayak, or just an old-school inner tube. So, before the summer slips away, grab a few friends, pack the cooler, load the boats and tubes, and enjoy one of the following classic float trips in Alabama. One of Alabama’s most popular summertime floats, Terrapin Creek is a relaxing 8-mile paddle that weaves through wooded hills and pastures east of Gadsden. There are many places to stop and cool off for a swim, and you can easily float the creek’s upper and lower sections in one day. Nearby outfitters like Terrapin Outdoor Center and the Redneck Yacht Club offer a wide array of rentals, along with shuttle services. To float both sections, put in at the Frank Stewart bridge on County Road 8, about 3.5 miles north of Piedmont. This upper section runs until you get to the Terrapin Outdoor Center. From here, you can take the lower section to the take-out at the Ellisville bridge. On Terrapin you’ll find plenty fishing and swimming holes, and a popular summertime swim spot awaits on the lower section, complete with a rope swing. A haven for flatwater paddlers, the Flint River in north Alabama steadily makes its way south to the Tennessee River, passing rural and scenic landscapes. Almost anywhere during the float, you can stand up in the water, and the current is typically under 2 mph, so it’s the perfect place for first-time paddlers. Plus, there are several bridges and roads that provide access points, so you can choose trips of varying lengths, whether you want to float for a few hours or all day. For a nice summer float, put in at the Highway 72 bridge, as the water north of here is usually too low this time of year. The spot is also the put-in for North Alabama Canoe and Kayak, which launches hundreds of paddlers over the summer months and offers a wide selection of rentals, plus shuttle services. Numerous take-outs allow you to manage the trip the way you like, with most excursions lasting less than three hours. And there aren’t many hazards along the way, just some caves to explore and fish to catch, and Alabama sun to soak in. As the longest free-flowing river in the state, the Cahaba River is part of one of the most biologically diverse ecosystems in the country. 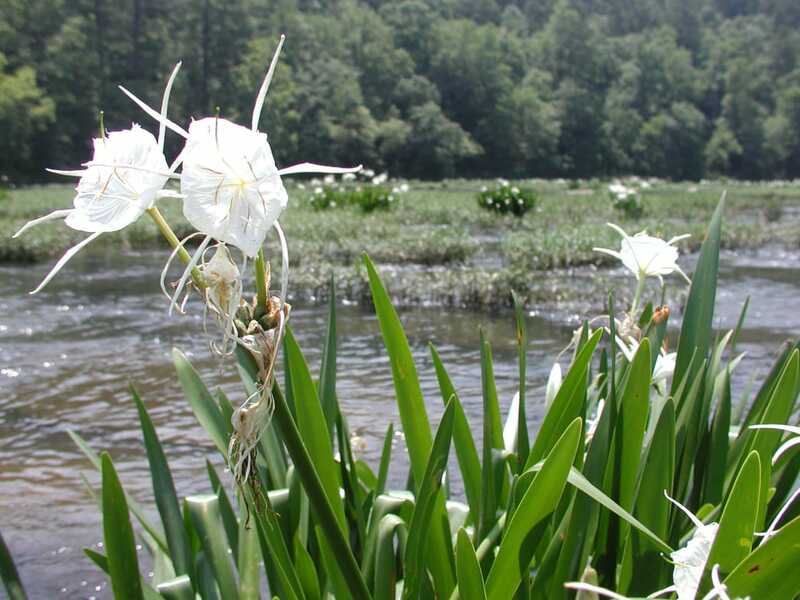 It’s home to more than 60 species of rare plants, including the sought-after Cahaba lily. So, it’s no surprise that a float on the Cahaba River is on the summer bucket list of many Alabamians. A hotspot for photographers hoping to snap a shot of the rare lily, the Cahaba begins its 194-mile journey in Trussville and ends in Selma. Put-in points include Civitan Park in Trussville, Grants Mill Road bridge, Old Overton, and many other locations close to Birmingham. An extensive list can be found on the Cahaba River Society website. Cypress Creek west of Florence offers a quick and easy summer float that you can do in half a day. Flowing with light currents, the creek runs by farmland, heavily wooded forest areas, and high bluffs. Along the way, you’ll pass a few houses and parks, so a float on Cypress Creek presents an interesting blend of civilization and untamed nature. Put in at the Highway 133 and Cypress Creek Crossing, and ignore the signs warning of a damn slightly downstream. It’s no longer a hazard, and you can easily pass through a cut-out section of a concrete barrier. Like many summer floats, there is the possibility of some shallow spots, and Cypress Creek is no exception. Depending upon the drought level, you might have to drag across rocky spots until you get to the first take-out spot 4 miles downstream. North of Wildwood, the creek does narrow as it weaves in and out of dense Alabama forest, making for a fast trip through the wild. After Wildwood, the next take-out is 3 miles downstream at the Savannah Highway Bridge. At a length of 265 miles, the Tallapoosa River begs you to indulge your adventurous side and plan an extensive multi-day trip. But, it’s also ideal for the casual lazy summer float. Part of the Alabama Scenic River Trail, the Tallapoosa begins its journey in the southern Appalachians of Georgia and empties into the Coosa River. It also flows through Lake Martin, a popular summertime hangout spot. The Lloyd Owens portion of the river is tailor-made for a sunbathing summer float. You can pick a section of the 40-mile stretch near Heflin, which is about an hour east of Birmingham. It’s nearly all flat water, with five access points. Also, two nearby outfitters offer rentals for kayaks, canoes, and tubes, along with shuttle services. Contact Tallapoosa River Outfitters or Southern Canoe Outfitters to plan a float or rent your watercraft. Written by Hap Pruitt for RootsRated Media in partnership with BCBS of AL.